An 11-year-old girl was killed at an Indiana summer camp when a tree fell onto a cabin during an overnight storm on Tuesday. The incident happened at about 3 a.m., when a tree was struck by lightning, causing it to fall onto a cabin at Camp Livingston. The unidentified victim was "seriously injured," according to a statement from Camp Livingston that was posted to Facebook at about 8:30 a.m. Tuesday. The girl was from Columbus, Ohio, according to Cincinnati's WCPO . According to camp officials, medics arrived shortly afterward but were unable to save the girl. No one else was injured in the incident. 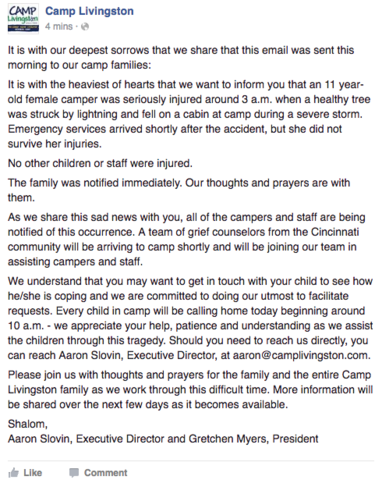 Camp officials organized for grief counselors to appear on site after the incident, according to the statement. Camp Livingston is a summer retreat for Jewish children that has been in operation for more than 90 years, according to its website .